MeriCrusher mulchers weigh significantly less than other similar-sized mulchers by other manufacturers. We have traditionally manufactured implements for use on wetlands, where light weight is essential. Light weight is an advantage in just about all tasks. A lighter mulcher can be operated using a lighter tractor, which saves costs. A lightweight mulcher attached to the rear linkage is also safer when working in challenging terrain. MeriCrusher mulchers reach depths of 20–40 centimeters below the surface. Even our smallest models provide deep subsoiling, which eliminates roots when land clearing. 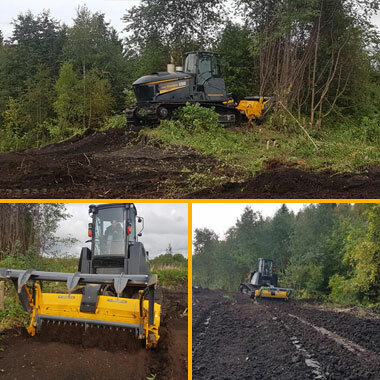 High speed above cround mulchers by other manufacturers simply spread the soil and wood chips on top of the underlying roots, allowing the undergrowth to grow back rapidly. MeriCrusher mulchers are designed from the outset to work beneath the surface. The biggest difference between our mulchers and those of other manufacturers is the rotor speed and torque. 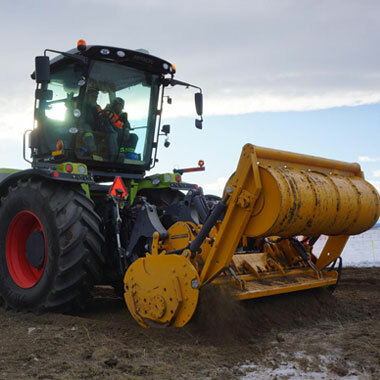 MeriCrusher mulchers spin relatively slow with high torque, which enables them to work effectively deep below the surface even when powered by small tractors and in stony soil. MeriCrusher mulchers offer low operating costs. Owing to their light weight, our mulchers can be powered by smaller and more affordable tractors. Our mulchers also use standard conical carbide cutters that cost a fraction of the price of custom made cutters. Due to the low cutting speed speed of our rotors, the cutters also last much longer compared to high speed mulchers. The rotor speed of MeriCrusher mulchers is between 8-10 meters per second, compared to at least 12 meters per second on competing machines. The rate of wear of the cutters multiplies rapidly when the spinning speed increases from 10 to 12 meters per second. Our biggest model can handle up to 768 horsepower, compared to around 400 horsepower for other brands. This is made possible by using our own made side gears and POC safety clutches that are designed in-house. The main clutch components are the same as those used in automotive brake calipers, allowing them to withstand the heat from slipping without damage even after glowing red. A little slippage protects the mulcher and tractor transmission from peak loads that could otherwise damage the transmission and engine. The working width of our widest model is 3.5 meters, compared to around 2.5 meters for other brands. At the same time, our 3.5-meter mulcher weighs about the same as 2.5-meter mulchers by other manufacturers. Our own gears and safety clutches enable the power required by such a wide mulcher to be transmitted safely through the transmission. 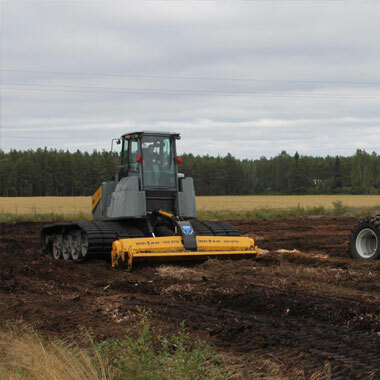 MeriCrusher soil tillers, mulchers, road crushers - A perfect solution to various operations in the fields of forestry and agricultural as well as in construction.